Words are failing me tonight, so this will be short and sweet :) I realized that I needed to restock my lemon soap...and you know I can never make the same thing twice! I thought I would add a twist this time by using 100% buttermilk for the liquid (I love buttermilk in soap!). 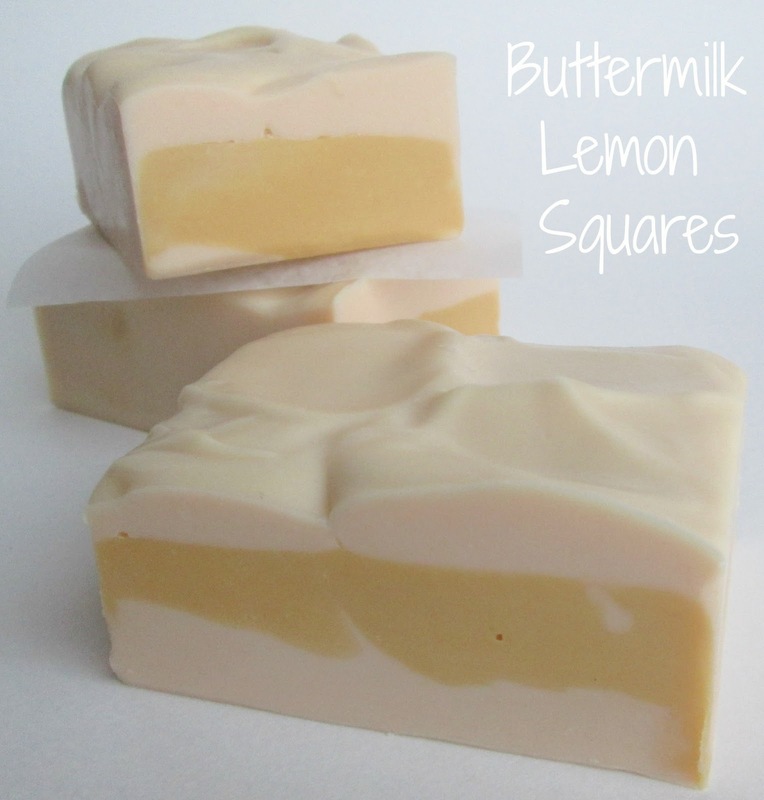 The soap is scented with a buttery lemon and citrus fragrance blended with rich cake batter. Could soap be creamier than this? I like it, grate job Cee! Did you know there was no such a thing like buttermilk here. Nor there is in surrounding countries. We have a ton of dairy products,but there's no buttermilk. I haven't tasted it yet,so I can't even find its counterpart here! Funny! I like your lemon squares, they're look so yummy! I'm not such an expert,but I know what whey is to cheese (by-product),that's buttermilk to butter. Whey can be bought here,but not the buttermilk. Maybe I should try make it myself,I'm so intrigued with it,as a soap ingredient. Yes...I guess if you could make butter, you could make buttermilk...would be interesting to try! Oh God,i wouldn't dare to think I could make butter myself. I meant I could try making it you way (with some lemon juice squized in milk). Nobody uses it here for cooking,nor you can buy it. You see how different habits our cultures have introduced in some basic things in our lives! Oh ha ha, yeah...it would be a lot of work to make enough buttermilk! Unfortunately, using lemon juice in milk doesn't give you the right consistency, buttermilk is thicker...between heavy cream and yogurt. Yes, it is sure interesting, the different markets...buttermilk is something we take for granted here...never occurred to me it might not be readily available in other parts of the world! If you need to restock, does it mean that we can buy this soap soon? ;) I tried in the summer something called piimä that should be like buttermilk. My soaps turned peach colored. I am not sure if this piimä is exactly like you have there. It is like thick sour milk. Ahh, you caught that Marika! Yes, this is one I will stock in the store :) Piimä sounds very similar to buttermilk, although the buttermilk stayed creamy white....peach color from the piimä would be nice! Your soap looks soooo out nice and creamy. I also love buttermilk soaps. The foam is much creamier and more attractive and smells to your safe yet wonderfully fresh. I like very much. Beautiful soap, Cee Gee! The scent sounds yummy - I love lemon! I'll bet the buttermilk is lovely, too. I will have to give it a try someday. Love buttermilk soaps, so creamy! You soap looks good enough to eat, Cee! Mhhhhmmmm yummy, looks creamy and rich!!!! Thanks so much Doreen, Jenny, Natalia & Vivien!!! I was kinda hoping for a recipe for lemon squares I could eat. ;) But a lemon square soap sounds absolutely yummy too. I've taken to subbing yogurt or sour cream mixed with milk to make buttermilk and it seems to work alright, at least for baking. I love how you come up with so many wonderful ideas.